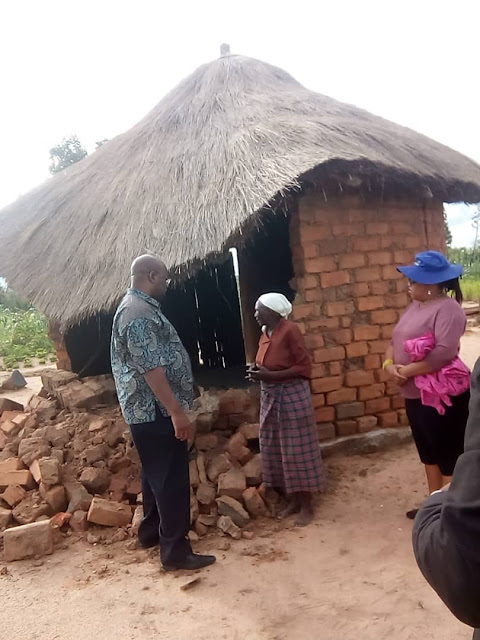 Great Zimbabwe University (GZU) has promised to build a kitchen hut and a two-bedroomed house for a 76-year-old woman whose houses were destroyed by Cyclone Idai. Sorotia Chigwindiri of Kudzerima Village under Chief Nyamandi is currently surviving in tough circumstances after his three huts were destroyed by the cyclone. The university has said it will provide everything needed for the work to be completed, including paying for the labour. Vice Chancellor Professor Rungano Zvobgo also promised to adopt two orphans Tafadzwa Dzivakwe (19) and his young brother George Dzivakwe (10) of Dzivakwe village. The orphans’ houses were also destroyed by the cyclone. GZU Dean of Students, Sarafina Mudavanhu said the university was a caring institution that is particularly compassionate about the welfare of the most vulnerable. “Last week, the Vice Chancellor Professor Rungano Zvobgo and his team carried out an assessment in some affected villages in Gutu Central and resolved to help the old lady. The houses will be built soon,” said Mudavanhu. She said Chigwindiri no longer has any close relatives who are capable of giving her a hand. “We heard that a child she used to stay with ran away from home. We hope this will also be a great learning opportunity for students studying courses that are focused on development and community welfare,” she said. Gutu assistant district administrator, Benedict Gwede thanked GZU for its generous response to the ravages of the cyclone. “We really appreciate the assistance that the university and government, through various stakeholders, are giving us. We appeal to everybody with something to give to urgently come forward and make a difference to the many people who were affected by the cyclone,” said Gwede.